I picked my first Liberty apples this year, and I have to say that I’m impressed. Liberty is a great choice for the home orchard, packing a one-two punch of exceptional, sweet-tart flavor along with disease resistance. In university trials, Liberty exhibited good resistance to apple scab, cedar apple rust, powdery mildew and fire blight. 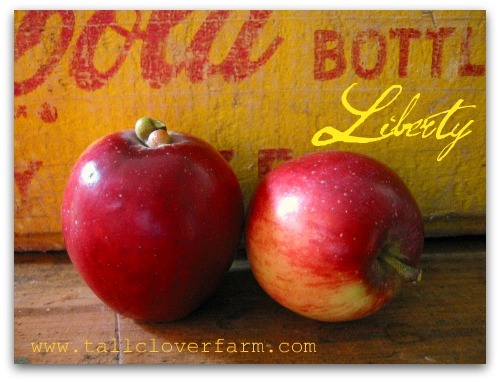 A crispy and juicy keeper, Liberty is on my short list of great apple trees to grow organically. I’ve listed my other favorites below. The following beauty pageant of pommes is by no means comprehensive and merely represents some respectable harvests from my young orchard (where no pesticides are used). 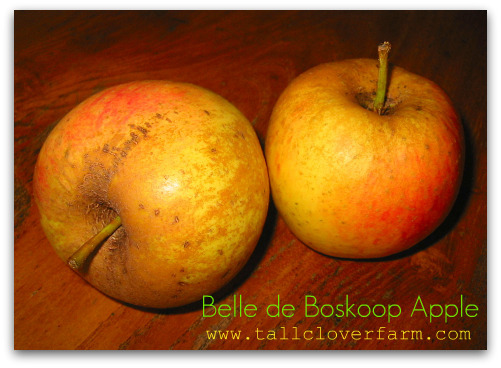 Belle de Boskoop apple: I would have planted this tree merely for its name (pronounced Bell-da-boss-k0e), lucky for me it’s a all-around great and heavy producing apple with lots of personality. Wonderfully tart, the flavor is unique as if you spritzed lemon juice on it. While it bakes well and is perfect for applesauce, it does get soft if not placed in cold storage. It seems to be a biennial producer for me, with alternating years of light and heavy harvests. 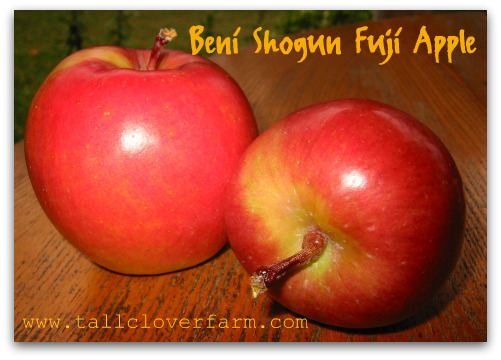 Beni Shogun Fuji apple is one of my favorite fresh eating apples. Because Fuji needs a long growing season, and I live west of the Cascades where long summers rarely vacation, I was in search of a sport of Fuji that was better suited for cooler climates. I found Beni Shogun Fuji and I’m happy to report old Beni is a champ, weathering our cool growing season admirably. The apples were glowing red and firm as an unripe pear. A few weeks in the fridge and they mellowed into juicy little sugar bombs. 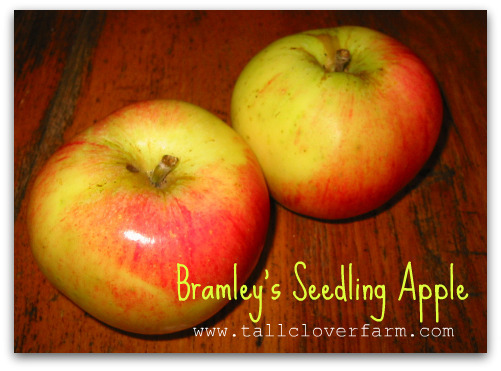 Bramley’s Seedling apple is handsdown my favorite baking apple. It’s a tree that says stand back, I’m ready to grow some great cooking apples and plenty of them–such a very heavy producer, that Bramley’s Seedling usually requires support stakes to keep the overloaded limbs from breaking. Apples are big, firm, crisp and flavorful–tart for sure, and perfect for cooking or eating fresh though on the uber-tart side. Cameo apple had me at hello. I was willing to take a chance on this apple, not sure how well it would grow in Western Washington. 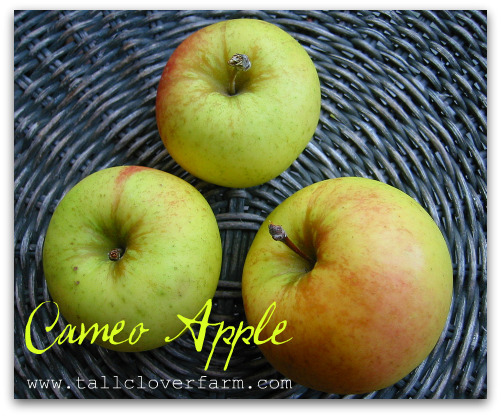 You should be able to find Cameo in your produce section, so give it a try. It is a juicy, crisp fresh eating apple suitable simply for dessert. Normally cameos are more red than yellow; perhaps their light blush is in response to my fondness toward them. 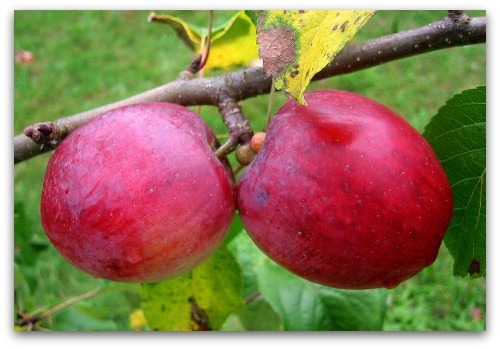 Esopus Spitzenberg apple is often known as the preferred apple of Thomas Jefferson. After its first harvest, I’d have to concur it is very good and I look forward to next year’s crop when the tree has had time to mature. It’s a very firm apple that rewards you with more flavor and depth if left to mellow in a cool place for a week or two. It is not the most vigorous tree, but again it is young and seems to be a biennial producer. 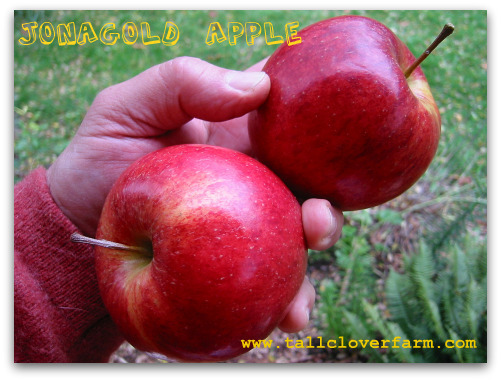 Jonagold apple is an amazingly good apple in my orchard. In fact, if I could only plant a couple apple trees, Jonagold would top the list. As a cross between a Gold Delicious and Jonathan, it brings a lot of flavor to the table. It is super sweet but finishes off with a very nice tartness. Fresh eating or cooking up a storm, this is my prize pick for best apple this year. More from WSU extension. York is one of those apples that tastes like it has a history (and it does). 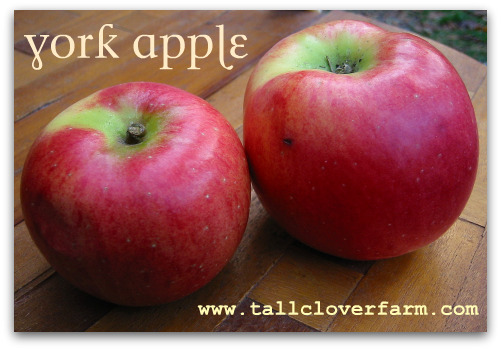 Discovered in 1830 in York, Pennsylvania, the apple enjoys a subtle flavor and appealing, firm texture. While not overly sweet, York is an apple I could eat everyday, whether or not it actually did keep the doctor away. Big and lop-sided usually, it’s also a very good baking apple. That’s about it for now, but I have a couple other newly planted varieties I’ll be reporting on later, including Calville Blanc, Hudson’s Golden Gem, Gold Rush and Ashmead’s Kernel. Here are some related links you may be interested in. Yes, our liberty apples were delicious this year as well (although, to be fair they were the only apples we got). I’m interested in hearing continued reports on all of the varieties you grow since we live so close and I am looking to plant a diverse orchard of 50+ trees on our property in the next year or so and I continue to look for varietal selections to add. Any good tips for cider apples? What an informative and creative post. The “jonagold galette” was a winner!! Maybe you should organize an “apple pie throwdown!” I live near Bellewood Acres, an amazing farm. Honey crisp is one of their big sellers. What a beautiful Posting! It is tribute to Washington State Apples and the master gardener. Hi Dominic, the only cider apple I have is Kingston Black, but I tend to like sweet cider (I know, so uncool), so I plan on making hard cider from the eating apples I currently have. Checked out your site, Olympic Acres looks like a dreamy spot. I am passionately fond of apples and have missed the fresh ones I was getting in Lebanon; thanks to you I am going to be looking for these varieties, although I am familiar with the Fuji and Cameo, I have never had the Liberty or any of the others. Can’t wait! Ack! I am all out of space in my orchard. The Liberty sounds great. I do have a couple of Gravenstein’s I’ve been nursing along but I have been disappointed with their lack of disease resistance. I might have to give up on my dream of having my own Gravenstein trees and switch these out. I’m definitely on the side of finding trees with as much natural resistance as possible. I didn’t understand this issue well when I bought the Gravensteins. Sandy, I too planted a Gravenstein. Love ’em and am willing to put up with ugly apples and a wimpy tree to have them. Each year it gets a little stronger and produces a little more, plus it’s easy to overlook its shortcomings with a couple pies under my belt. Tom, this is great. You and Apples and Oranges, bracket the extreme apple conditions for the whole West Coast. I haven’t tried them all, but Liberty is my favorite tasting of all the hardy low-maintenance varieties. Oh to have an orchard. Your fruit comparison posts are always so dreamy, Tom. I’m glad I planted a Liberty last year! 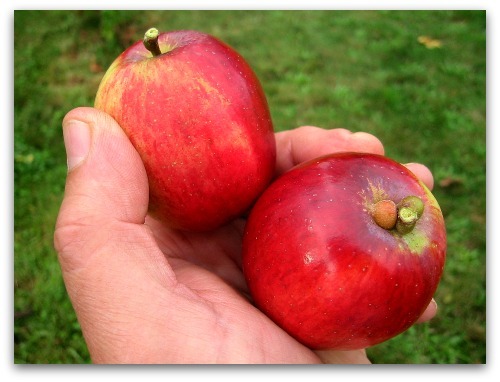 Now to take out the Cox Pippin and replace it with one of those others…Thanks for linking up to Simple Lives Thursday! Tom – how many tree do you have? how much space do they occupy? brion, I have about four acres, of which a half acre is orchard. The trees are semi-dwarf rootstock and spaced about 15 feet apart. I have about twenty different apples, and about ten various pears varieties that have only been in the ground a year or two. 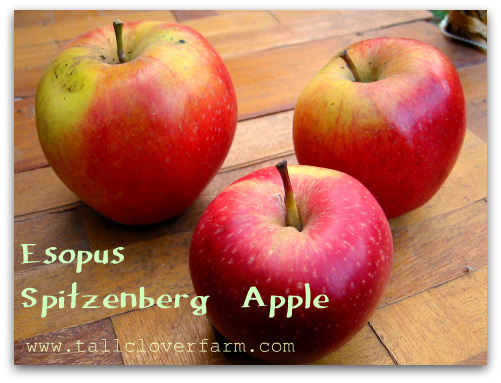 Do you have all of these apple variaties in your garden?? Waw!! I love Boskoop the most. It is a Dutch word, did you know that? Jonagold too! I too like Liberty the best! Such a great apple, great-tasting applesauce from even tiny green apples, like the Ein Sheimer I used to grow in sunny San Diego. I also like William’s Pride, an early apple, since it is big, red, and tasty, and somehow because it is early it rarely has any codling moth damage. Sweet Sixteen, with a nutty taste, and Freedom also didn’t have much codling moth this year, we took apples to a cider pressing party and made cider, and I cut many in half and found only a few with damage. Hannah, thanks for the apple tips. I’ve been wanting to put in a Williams Pride for all of the reasons you stated–now I just have to. I’ll check out Freedom and Sweet Sixteen as well. I have seen Cameos at my grocery store, but have always passed them by. Next time, I will get some. oh i love bramleys! my favorite baking apple too — i have never found an apple that fluffs when it bakes, like a bramley does. yummy with a soft, sweet pie crust, more cakey than flakey. yum yum yum. Liberty.. my favorite! Full of flavor, gorgeous color, and not too soft-not too hard. Thank you for this! I have a tiny patch where I’d like to grow apples and have been looking for ideasof what to plant. I’m delighted that you mention Bramleys…they are the best cooking apple (imho) but I haven’t been able to source them in the US. Where do you buy yours from? Hi Kate, I’ll update the post with some links to nurseries I like and at least two or three of them usually have Bramleys. Good luck!